Listening is a powerful thing. This simple thought has helped Dell to better engage with our customers, improve product lines and build out business priorities. But we knew there was so much more that could be achieved by lending our innovation expertise to the online community. The ongoing positive impact continues. 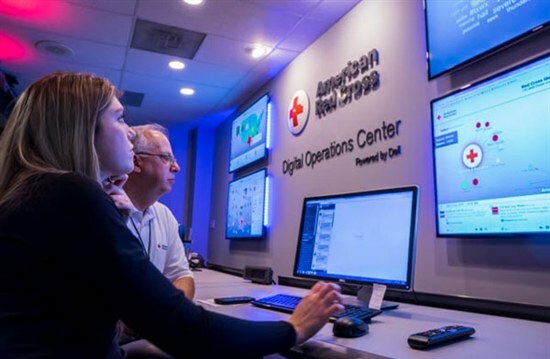 Two years ago, we jointly announced the launch of the national American Red Cross Digital Operations Center, the first center of its kind dedicated to humanitarian relief. Born from a tour of Dell’s Social Media Command Center by the Red Cross at our Texas headquarters, the center was instrumental in providing aid during Hurricane Sandy and many other events. On April 3, we announced the expansion of this model – and the promise of faster relief during disasters – to the regional level with the launch of the North Texas Digital Operations Center of the American Red Cross. The newest center will provide another location for social engagement during times of need and will allow data to influence near real-time response efforts. Along with equipment, training, and funding, Dell will provide real-time social-analytics software to aid the organization’s health and safety preparedness efforts. “Communications during a disaster is always the biggest challenge because things are not working. Towers are down, people can’t communicate through traditional means… social media enables us to get to folks in real-time and pass along lifesaving information,” said T.D. Smyers, CEO, American Red Cross North Texas Region. We hope to see similar results at the regional level that we have seen with our national center. After Hurricane Sandy, more than two million social media posts were sifted through and helped expedite responses to those in need. 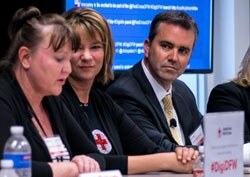 “Through the Digital Operations Center and through our partnership with Dell Services we’re able to really take a look at the social conversation that happens during a disaster, and we’re able to see where the needs are in a community,” said Laura Howe, Vice President, Public Relations, American Red Cross, when asked about the organization’s social listening capabilities and success since the launch of the first Digital Operations Center. Additionally, for two months after the initial storm event, more than 30 digital volunteers responded to thousands of individual posts through Facebook and Twitter. In nearly 90 cases, the Red Cross adjusted its services based on information gained through social data and the national Digital Operations Center. The organization’s commitment goes beyond just leveraging social listening tools to improve its response, but also “making social media part of the operational DNA of the Red Cross,” Howe explained. We always knew that our social listening and analytics expertise (developed in Dell and with our external customers) delivers actionable insights that create business value. It’s very gratifying when we can leverage that same expertise for humanitarian aid and extend our positive impact to organizations of all types. Click here to learn more about our social media services efforts and follow our social team on Twitter at @SocialatDELL. You can also follow the American Red Cross North Texas Region at @RedCrossDFW.